Santa Ana Dentist , Dr. Arcila was raised and educated in Medellin, Columbia, South America. Graduated from Antioquia University, has been practicing since 1978. He has built a foundation of trust with his patients, many of whom have been under his care for years. He is fluent in both Spanish and English and has extended experience in all dental procedures, including surgical procedures. Dr. Arcila’s mission is to deliver the best possible dental care, and assured his patients satisfaction. 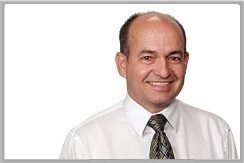 During his free time, Dr. Arcila enjoys spending time with his family, sky gliding, tennis and working on his car. Smiles On Bristol Dentistry is proud to offer Dr. Arcila’s services to the great community of Santa Ana, South Coast region and the Orange County Airport.